The Trendy Gals made some cute Mini Cup Easter Treats to show you today and I'm here with mine. I used Strawberry Cupcake Trendy Twine and some Raspberry Cupcake Sequins on my Mini Cup. The Twine is wrapped around the cup and then I put my stamped and die cut image over top of that. I used these cute Peep stamps from Simon Says Stamps. Then I punched out a circle for the top and stamped the Happy Easter from a My Creative Time set onto it. It needed a few Raspberry Cupcake sequins and some more Strawberry Cupcake Trendy Twine around the lid with a small bow. Be sure to head over to Twine It Up! with Trendy Twine to see the what the other Design Team Gals made--they are so cute! You know me and my love of all things pink, so this cup is totally calling my name LOL! I love those peeps and the Strawberry Cupcake TT couldn't have been more perfect. Happy Easter! This so cute, Helen. Loving all of the pink and the Peeps are perfect and super adorable, too. Ooh, so CUTE! 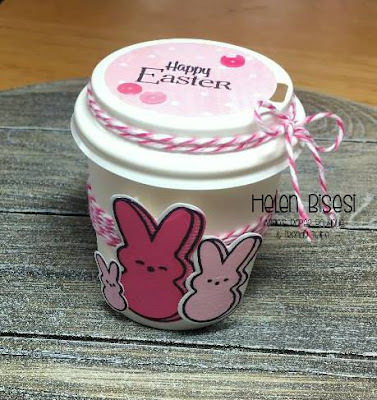 Adorable treat cup! Oh my goodness Helen, I just LOVE this cute little cup! Peeps are my Fav!